I recently got sick of doing science. After observing my own productivity and passion for science ebb and flow over the past few years, I've found that I live a roughly 6-month cycle: 6 months of scientific experiments, 6 months of something else (usually programming, often blogging, sometimes installing hardware floors and doing experiments on myself). It seems that when the weather starts to warm I find myself taking a step back and reflecting on what I've done in the last half year... and deciding not to do any more of it. Reflection-time seems to have come early this year, likely accompanying the early warm weather to Boston. So what to do instead of experiments? I usually direct my idle-free energy toward programming, but I was looking for a small project, just a little something to change the pace of life. Way back in 2009 I wrote a simple web-app called the Exon-Intron Graphic Maker. It gets used about a couple hundred times per month, which I find pretty neat for such an esoteric, simple piece of software. And people seem to like it. As you can tell from the comments below, there have been some feature requests, but until last week I had not an inkling to do any of them. Mostly because I couldn't figure out a simple user interface for some of the features. But then in a conversation with Christoph we came up with some good ideas, so away I went. Colors! You can now color your mutations and deletions from a small handful of colors. Labels! The gene's name, mutation labels, and deletion labels will now be displayed in the graphic. No need to import the PDF into another program to add these labels. Protein Domains! Due to popular demand, you can now specify protein domains (in amino acid coordinates) and they will get shaded with the selected color. This can be handy if you want to visually compare where a deletion (in nucleotide coordinates) is relative to a protein domain. Save as PNG! You can now right-click on the generated image to save the image as a PNG. This feature worked before in Firefox, but now it also works in Chrome. As always, you can download a publication-quality vectorized PDF, which includes colors, labels, and protein domains as well. If I get some momentum, I may still implement alternative splicing as well as a possible protein-only view with just domains and mutation/deletion sites displayed (introns and UTRs hidden). UPDATE #2 (Nov 19, 2009): Users can now change the scale bar to any length they'd like in the Exon-Intron Graphic Maker. The default had been 100 bases, but for people working with genes much longer than worm genes (such as human genes), the scale bar would disappear into single-pixel oblivion. So now users can set the size of their scale bar - a minor victory in the ongoing war for all that's good in this world. UPDATE #1 (Aug 9, 2009): I've just updated the Exon-Intron Graphic Maker with a few more features. You can now use it to draw untranslated regions (UTRs) of genes, indicated as white, unfilled rectangles. It's also easier to input your gene sequence, as exons can be indicated as UPPERCASE bases and introns as lowercase (which is how some services, such as the C. elegans sequence repository at WormBase.org, store their sequences). You can still enter exons and introns separated by commas as well, if you don't use case in this way in your own sequence files. Finally, you can also enter specific locations or regions, and the program will draw arrows and brackets around the regions. This can be useful for indicating mutations and deletions in your gene. The most important concept in the field of molecular biology is known as the "central dogma". The central dogma basically says that in a cell, DNA is used make RNA, and RNA is used to make protein. Proteins are the physical chunks of molecules that enable the cell to do many of the things that a cell does: move around, ingest things, secrete things, stuff like that. While the central dogma is a simplistic view of molecular biology, it seems to be mostly right. So let's talk about the first two pieces, the DNA and the RNA. DNA and RNA consist of repeated molecules chained together. The molecules that make up DNA and RNA are called "nucleotides" (also known as "bases"), and there are 4 different kinds: adeninine (A), cytosine (C), guanine (G), and thymine (T) in DNA or uracil (U) in RNA. When you identify the order of these nucleotides in a specific piece of DNA/RNA (e.g. ATTTTCGATCGCTTTAGC) you're said to have "sequenced" the DNA/RNA. What surprised many biologists when they began sequencing DNA/RNA was that though there was a ton of DNA (billions of nucleotides in humans, a hundred million in the microscopic worm C. elegans), only a small fraction of it was found as RNA. If I remember right, the statistic is something like ~1% of DNA actually transcribes into RNA in humans. One last definition: a portion of DNA that will eventually be converted via RNA into a single protein is called a "gene". So within a given gene, biologists found that some parts get cut out of the associated RNA before it can be translated into protein. These parts of a gene are called "introns", while the parts that eventually become protein are called "exons". In this graphic, the exons are indicated as black rectangles. Filled rectangles indicate RNA that is translated into protein, while unfilled rectangles indicate RNA that is not translated into protein, though also not cut out like introns are. The introns are indicated as bridging gaps. This representation of an intron is appropriate because the RNA effectively gets "stitched" together in this way, with introns getting cut out. In the example above, the gene has 8 exons and 7 introns. These diagrams are also supposed to be to scale, so that the lengths of the rectangles and gaps correspond proportionately to the lengths of the exons and introns that underly them. The little downward arrows above the exons point to specific bases (e.g. ones that have been mutated). The upward-facing horizontal brackets below the introns indicate regions of interest (e.g. parts of the gene that have been deleted). I was talking to some labmates about these graphics, particularly wondering how they generate them for their papers. As it turned out, both of my friends effectively drew them by hand on a computer, counting out the number of nucleotides in each exon and each intron and drawing boxes and lines of rougly the same proportions. This seemed tedious and error-prone, so I asked them if they knew of any programs that could make these graphics for them. They knew of none, and I mentioned that it would be trivial for a programmer to make one. They thought it would be really useful if someone made such a program, but of course they themselves didn't know how to program. So I added it to my mental list of nifty tools for scientists that I might one day make. Perhaps the most important feature of this webapp is that it produces a vectorized, high-quality PDF of the inputted gene model. When submitting a paper to a journal for publication, the journal requires high dpi, publication-quality graphics (simple bitmaps just don't print well). With a PDF containing vector graphics the biologist can scale the gene model to whatever size and resolution they wish, annotate it with other information (e.g. scale, gene name, mutation names), and submit to the journal, all without any loss of visual quality. Thank you very much for making this available. Thanks, this works great. A few things though. Some of us work on large (18kb) genes. Is there any way to change the scale bar? Also, being able to indicate alternative spice events would be nice. Thanks for the request jasonll. I've updated the graphic maker so you can now change the size of the scale bar, to be something more appropriate for your 18kb genes. Not sure what the convention is for indicating alternative splice sites - why not just make 2 separate gene models? I guess if there are several it would be nice to consolidate them into one image. If you have any ideas about what this would look like, lemme know. 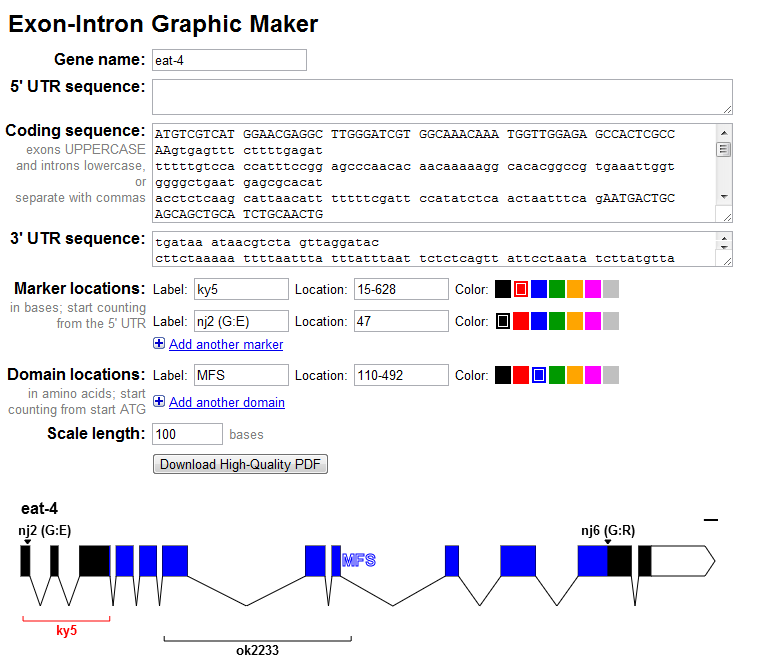 Alan Marnett over at Benchfly.com asked me to write a blog post for them about the Exon-Intron Graphic Maker. It's just like this post, slightly revised. Storing the link here for safekeeping. thanks for the scale bar modification. about the alternative splicing, i suppose it would be helpful if you could color them in. this would also be helpful to mark out certain functional domains easily. three or four colors would be wonderful and spice things up a bit! i also wanted to thank you for making this available. saved me so much time. also wanted to second jasonII's comment about other colors, for marking protein domains, etc. but its wonderful, thanks a million. Thank you very much for this. I am an undergraduate doing a genetics research project and this has given me the ability to graphically show exon and intron positions the way I wanted to! Great tool. What you also might want to consider is that UTRs can be across more than one exon. I think with the current options it is not possible to do that. Pascal, actually I think you can do what you want. Just like with the protein-coding field, separate exons and introns in the UTR fields with commas, and you'll be all set. 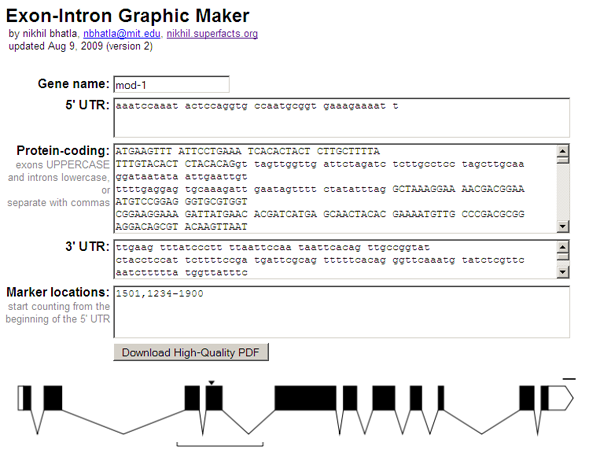 That way you can display a single UTR containing multiple exons and introns. I wonder if its possible to extend the image to show up and downstream regions? Thank you thank you thank you so much for sharing this program. You have saved me huge amounts of time and it is such an easy and intuitive program to use! Thank you for this awesome tool! I used it to make a figure for my PhD thesis. I couldn't find any other tool that would draw high-res gene structures for me. At first, I was skeptical, because your tool required manual input of the sequences and boundaries, when this information is already available for my genes in GenBank. Also I was worried that the spaces and numbers that were contained in the sequences I pasted would mess things up. But it worked fine and only took a few minutes to copy-paste the sequences and put the commas. The genes I'm working with are monster genes with tons of exons each, and some very long introns, so I'm glad it worked so well. The only thing I would have liked is to have an option to have the exons numbered. very cool! i'm using it to make group meeting slides, and am finding that the text is coming out a bit small. any way you could add a feature to let you change the font size? To make changes to the text or anything else in the graphic, download the PDF and open it in your favorite graphics program. I use the open source alternative to Adobe Illustator called Inkscape. There you can make any changes to your heart's delight. How to add the size of exons (bp) or introns (bp) in the map? For comparison of same gene of different organism, is it possible to go in single run? Although it is very helpful I would like you thanks a lot. There is currently no way to automatically annotate each exon or intron with its length in base pairs. I have never seen this kind of annotation before. Can you point me to an example of what this would look like? Also, there is no easy way to compare multiple genes (e.g. across organisms, across isoforms) at the same time, yet. This feature has been requested several times so I may add it in the future. For some reason, the scale bar isn't changing for me whatever number I put from (1-1000bp). Is there anyone else facing similar problem or is it me only?? What browser, browser version, and OS are you using? Are you referring to the graphic made in the web browser, or the downloadable PDF? I just tested the graphic generated in the web browser on Firefox, Chrome and Internet Explorer on Windows 7 and the scale bar resizes just fine. How many bases have you entered? You have to enter some bases before the scale bar will be displayed. Thanks for your reply. I misinterpreted the use of the scale bar. Is there any means to increase the width of the exons ? (and the introns could probably be joined by dots which are not to scale) I am working on human genes and there are a good number of mutations to show in a single exon itself. The width of the exons doesn't permit me to be able to show all the mutations. There is no method for increasing the width of the exons. The main function of this app is to quickly make exon-intron graphics that are to scale. I'll keep your issue in mind, but for now I suggest using the Exon-Intron Graphic Maker to make the gene model to scale, and then downloading the PDF to alter the scale in a free app like Inkscape. You could also mark all the mutations in the Graphic Maker, even if they overlap and are too dense, and then spread them out in the PDF so that relative position within the exon remains to scale. I really enjoy the program. Please excuse my otherwise probably simplistic question. When creating a gene diagram, there are some exons that could be small at only few dozen bps. Some introns, on the other hand, could be thousands of bp. If done this way, when looking at the final graphic the exons are tiny because they are drawn to scale in proportion to the intron size. Is there a good way to account for that or would you suggest a different way to graphic it? thanks! YZ, I would suggest a different approach in your case. Seems like you want a graphic that has different scales for the exons vs. the introns. My webapp doesn't support that right now, I'm afraid. I'm not aware of any way to do that except by hand in a graphics program. The tool is very elegant and handy.Brilliant solution for presenting gene structures in publications. I have a suggestion for you, add a 'How to cite?' section. Thank you for the program. It have been very useful for me. Could it be possible to add a section upstream and a section downstream of the beginning and end of transcription (respectively)? It would be very useful to add markers in those sections. Thanks! Yeah, there isn't any easy way to depict non-transcribed regions using this web app. I'll consider adding something like this in the future. Glad you find this useful. Good morning, first of all thank you for the useful program. Is there any chance to change the color of the black bar representing the DNA sequence and to reduce it a little bit (or to increase the written label's size)? I know it is a futile quesiton but it will improve the appeal of my immage. Here it is, 2019 and 10 years after you made this, and I only just discovered this tool. I just wanted to say thanks for sharing, it is very much appreciated!